Jerry Cantrell knew more about the layering of guitars than any of his contemporaries, maybe with the exceptions of Billy Corgan from the Smashing Pumpkins and Kevin Shields from My Bloody Valentine. But whereas Shields (and often Corgan) made heavy use of overdubbing to create a wall of sound that was soft and dreamy – an aural comfort blanket – Cantrell wanted his guitars to smash your face in. They were huge and aggressive. They dominated the mix, crowding everything else out, leaving Layne Staley and Sean Kinney having to fight to be heard. The reunion album that AiC put out in 2009 attempted to give the vocals and drums a little bit of extra focus while making the guitars even bigger – the results proved the old audio engineer’s saying: If everything is big, nothing is big. Opeth are a Swedish group who started out playing death metal, but have got more multi-dimensional (and to my ears more interesting) as time has gone on. Most of their recent music foreswears death grunts, double kick-drum rolls and blastbeats in favour of acoustic guitars, twisty time signatures and a haunting, more pastoral vibe. Opeth’s main man Mikael Åkerfeldt is in the tradition of guitar layerers that runs through Cantrell, Shields and Corgan, back through Bob Mould, Tom Scholz and Lindsey Buckingham and all the way back to Les Paul, so it’s no surprise he’d be an AiC fan. Opeth’s version of Would? (a B-side from 2008) is mighty fine and extremely well played, particularly by drummer Martin Axenrot, who can drum rings around Sean Kinney, or anyone else. But it’s great in a different way to the original, in a way that leads you to appreciate the original more. Opeth’s version is precise and clean, and sounds like it was probably played to a click track. As much as a record like this can, it grooves. 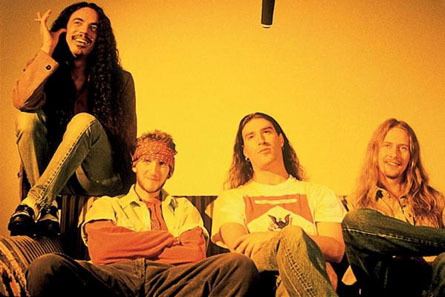 Alice in Chains’s version is a barely restrained race to the finish, with an ear-grabbing tempo increase over the course of the first verse and chorus. This is not necessarily a negative thing at all; listen closely to some Led Zeppelin if you think rigid adherence to a fixed tempo is necessary for good-feeling rock music. Åkerfeldt sings the song calmly; he sounds like a man taking a detached, almost scientific, interest in his physical and emotional disintegration. Layne Staley sang it like he sang everything else: like a man in agony, someone in way too much pain to be able to get any kind of distance from or perspective on himself. Similary, Åkerfeldt’s guitar sound is heavily distorted but clinical and cleaner than Cantrell’s, which has more midrange content and is a little “messier” and less controlled tonally. While it’s likely that Dave Jerden (the producer and engineer on Facelift, Dirt, Sap and Jar of Flies) had input into the structure of the songs, Cantrell is nevertheless recognisably a master of song structure (try to think of any similar rock song as tightly wound and economical as Them Bones). Åkerfeldt inadvertently proves as much by removing the last repetition of the chorus in order to double the length of his solo; without that last vocal chorus, the sense of unstoppable momentum that we carry into the killer last section (‘Am I wrong?’ with its huge, disorienting plunge from C to F#) is reduced, and with it goes a little of the song’s emotional wallop. And that’s what I dig about AiC – for all the distortion and dissonance, they were a rock band with great, tightly written songs, not riffs for riffs’ sake. If you’ve never given them a go (and for years I didn’t – they seemed “too metal” to teenage me), you may be surprised. This entry was posted in Music and tagged #1 Record, AiC, Alice in Chains, alternative rock, B-side, Burden, Dave Jerden, death metal, Dirt, electric guitar sounds, Facelift, fashion in mixing, grunge, guitar solo, Jar of Flies, Jerry Cantrell, Layne Staley, Led Zeppelin, Little Differences, Martin Axenrot, metal, Mikael Åkerfeldt, Opeth, Sap, Sean Kinney, songs, songs that speed up, Sound recording and reproduction, tempo, Them Bones, Would on January 23, 2015 by rossjpalmer.